It only took about 4 months or so, but the project is finally finished! 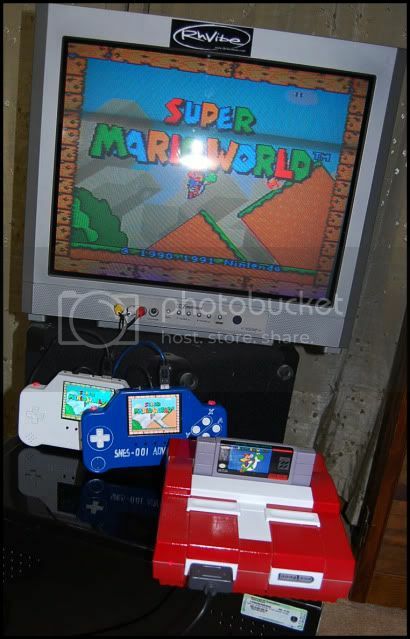 The evolved version of the the original SNES-001 Advance is now functional and working nicely! Though the other posts on this suggest that this may have been a mod that I had an idea what I was doing, this for several reasons was a completely new project all together. The fact that these controllers can be used by any SNES system whatsoever is a huge jump from the original. This “Breakout Box” (as you’ll read about in the forums), though simple, is something I’ve based a much larger project off of and have continued to perfect its design. This could easily have been accomplished by wires and connections in that respect, but the CNC machine that has been so relevant to my current progress continues to be tested in a variety of different methods. So, with that said, the completion of the project is just a mere shadow of what’s on the the way and will surely be looked back on as the foundation stone to which I built my best projects off of. Anyway, enough with all that. Have a loot at the video below to see exactly what I’ve been talking about! Can’t play the video on my e-mail site. No play button�� Will check the fb site to see if that is different. It’s on my You Tube channel too. You can just click on the big “My You Tube” icon on the left to check it out. SolidWorks learning curve worth it! Thank You SS and MBB!